And in these 3 recipes, they get all dressed up! From a 1-pound bag of brown lentils, I made all 3 of these easy dishes. First you sprout, then you cook. It's as easy as pie! These simple sprouting instructions yield themselves to many, many delicious dishes. Put lentils in a bowl. Fill with water so the lentils are covered by a couple of inches. Let soak overnight. In the morning, pour lentils and water into a colander. Rinse well. Place colander on a plate, cover, and leave on the counter. Rinse again in the evening. Cover with cloth and return to counter. Repeat the rinsing every morning and evening until the lentil sprouts reach your desired length. I like to leave mine for 2 full days. Store in the refrigerator. Enjoy in sandwiches, on top of salads, or as a coleslaw. They also make a delicious meat substitute for tacos, burritos, and enchiladas. Or eat as a cooked side dish! Add chopped veggies to raw sprouted lentils. Toss with a salad dressing. Enjoy! Steam sprouted lentils until al dente. Pour into a bowl. Over medium high heat, add olive oil to a skillet. Toss in garlic. When garlic begins to sizzle, add cumin and coriander. Stir for about 30 seconds. Take off heat and drizzle over your waiting lentils. Add lemon juice. Stir. Season with salt and pepper. My latest (Mediterranean!) variation of this dish includes oven-roasted (or sun-dried) tomatoes, kalamata olives, and feta cheese. I also think it would be lovely to add sauteed chopped spinach or swiss chard. Begin by steaming sprouted lentils until cooked. Taste them as they cook so you can decide how soft you like them! Set aside. In a skillet, saute an onion, if desired, in olive oil. When soft, add steamed lentils and a bit of water. Sprinkle in taco seasoning. Stir as the water, onion, and lentils cook. Taste every now and then to adjust seasoning if necessary. Also, feel free to add more water to help lentils and spices combine. Use in place of meat for tacos, burritos, enchiladas, taco salads, and more! We use this taco seasoning mix for meat, lentils, and pan-fried salmon. Very delicious, but a bit spicy, so be sure to tweak it to fit your taste buds. Combine all spices in a storage container. Use whenever a recipe or your cravings call for a little taco seasoning goodness! 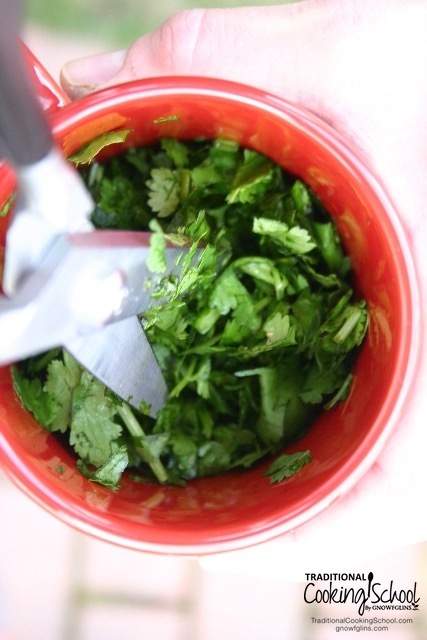 1 mug + a bunch of fresh herbs + a kitchen scissors = chopped herbs in no time at all! Do you eat lentils? 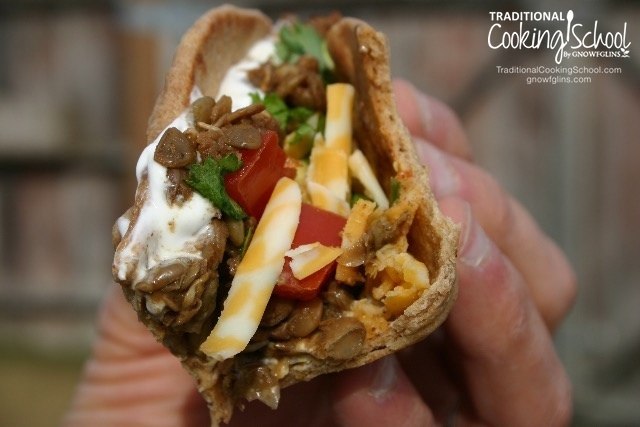 What dishes made from sprouted lentils can you share with us? Thank you Erin! Funny you should post these lovely recipes today. I just finished sprouting my very first sprouts ever (wheat berry) and I am planning on lentils next so now I’ll know exactly what to make with them! Wonderful. I can’t wait. .-= Michaela´s last blog post… My how they reproduce!!! =-. How long do you steam your lentil sprouts for? Do you put them in a steamer basket over water? I have some sprouted lentils and would love to try these recipes! Rebecca- When I steam the sprouts, I do put them in a steamer basket over boiling water and then cover it with a lid. As far as how long… I wish I could tell you an exact time. Give them a taste at 5 minutes and then 10 minutes. Keep doing that until you get your desired bite. I’d love to hear what you end up doing with your lentils! them raw because I though steaming or cooking will eliminate nutrients. These look great. My daughter who normally doesn’t like lentils wants me to tell you that you they are delicious seasoned and roasted until crisp. They disappear quickly at our house. CW- Maybe your daughter will like one of these recipes, too! The taco lentils are one of my favorites. 🙂 I’m curious how you roast them. Do you cook them until al dente and then roast? I’ve done that with chickpeas, but never lentils. How do you do it? Sounds like a fun treat! I just want to make sure I sprout the lentils correctly….I only soak them the first night…right…after that it is just a rinse. This is my first time sprouting, and I am so excited. I can’t wait to try the spicy lentils!!! Holly- Thank you for your kind comment! Nice to hear from another Alaskan. 🙂 It is a joy, isn’t it, taking care of the many blessings we’ve been given and thanking God through the way we serve others and enjoy healthy foods! Erin, thanks for the delicious recipes. Allison was so sweet to share it with me and then I found the rest of the info on here. I just sprouted red lentils and it only took a day total! I knew they cooked a lot faster than green or brown. Have you tried the red before? Just made the salad and can’t wait to have it for dinner and see what my hubby thinks. 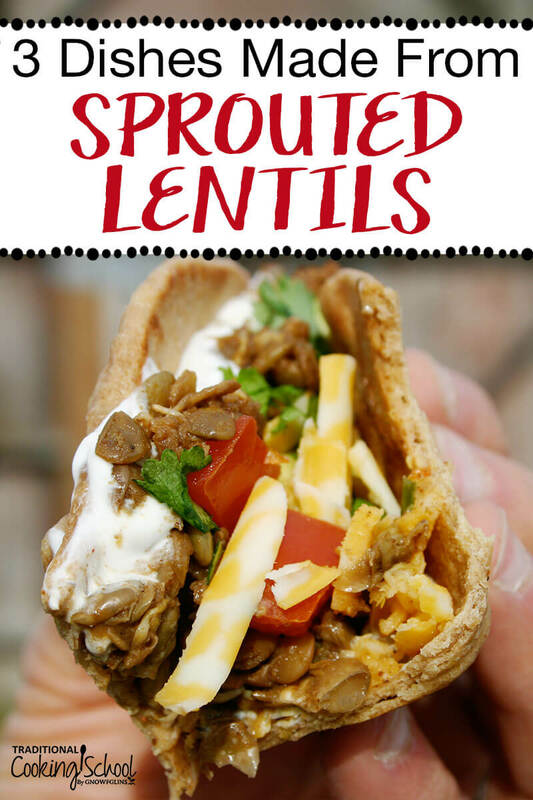 I am so excited to try the sprouted lentil tacos because I have a lentil taco recipe that our family loves and been eating for a while. How great to sprout them first though! I had only sprouted wheat berries in the past. I made Essene bread (just ground sprouted wheat berries). I would love to know if you have ever tried that one and if you have any recommendations for yummy add ins? Thanks for commenting, Pamela. Nice to hear from you! Oh my Word!!! I have always really liked lentils, but, This the 1st time I have sprouted lentils! I SO LOVE them!! They are awesome! I can see using these in many many ways, including just a grab and go munchie!! Yumm!! Thanks a bunch!! Did you mean 2 TABLESPOONS of cumin for the taco seasoning (larger batch)? I just couldn’t stand the thought of anyone not adding enough cumin to this delicious recipe so I thought I’d better inquire. 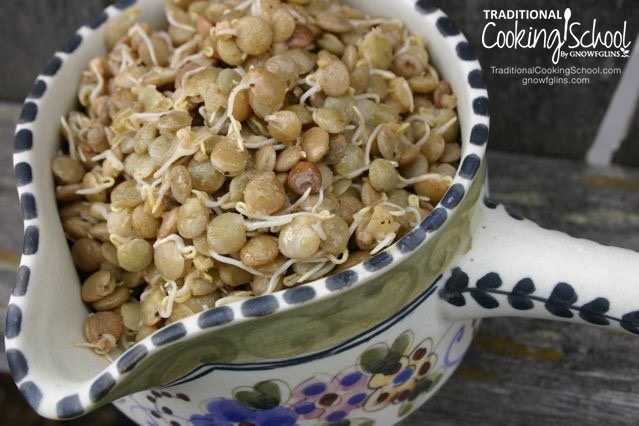 my lentil sprouts will be ready in nearest days – now I know what I will be doing with them! In cold winter days with snow and wind, sprouts are like first signs of spring. Let us know how you liked the dishes! we liked the lentil tacos very much. It’s a great idea. I just had the thought of having a taco party, with different types of fillings. Fish, lentils, and ground beef. That would be really fun for teenagers. The taco seasoning was really spicy though. I thought it would have a nice buzz but it blew me away at first, when I tried it in the pan. Fortunately the sour cream toned it down. Just wanted to give you some feedback, also for others who may have a sensitive palette. We enjoyed it and I’ll save this recipe for later. Thanks!! Hi! I just found this blog, searching to find some yummy sprouted lentil recipes. I think I’ll be making the tacos tonight. mmm! I was surprised to see you live in Anchorage! I just moved here about a year and a half ago, the Lord clearly called us up here, and it has been an incredible journey! Anyway, thanks for the recipes! Erin, I know why it was so spicy for us. It’s because I added my newly acquired *chipotle* chile powder, which is about as spicy as cayenne! I thought chipotle was the same as normal chili powder. No wonder it blew us away. 😉 Sometimes these funny things happen and the best thing to do is throw back your head and laugh. =D I’m looking forward to trying the “mild” version when I can get some normal chili powder! ha, I did a last minute change-of-mind, and ended up making the sprouted lentil slaw. It was awesome! So, I have yet to make the tacos, but I WILL be making them 😉 Thank you! My family and I loved the sprouted lentil tacos. I didn’t make my own seasoning as I’m fortunate to live near a bulk food store that sells a great MSG-free taco seasoning. I topped them with monterey jack cheese, lacto-fermented salsa, extra cilantro and garden tomatoes. Wonderful and quick! Excited to have found your site. Just started sprouting lentils myself and can’t wait to try one of your recipes. The tacos sound unique and yummy. Thanks. I just tripped on this blog post as I was Googling recipes for sprouted lentils. I sprouted a jar, and had no idea what to do with them. I wasn’t really intending to sprout them, but instead just soak them, but time got away from me. Then I got to the bottom of the post and read you’re from Anchorage. That’s fab. I live on Kodiak Island. How fun! Thanks for the comment Jeanette. 🙂 Hope you enjoy the recipes, and I can imagine the fall beauty of Kodiak right about now. Have a great day! First of all, it was a blessing to learn more from a fellow sister in Christ! I sprouted my first lentils and was in search of some recipes. I look forward to perusing your site more to gain a little more culinary insight! Thank you! Welcome to Gnowfglins, Kelly! I’m sure you will find many helpful tips in this place. Wardeh does a great job! Let us know how you end up preparing your lentils. I especially love the tacos. 🙂 Thanks for your comment! Hello fellow sprouters! 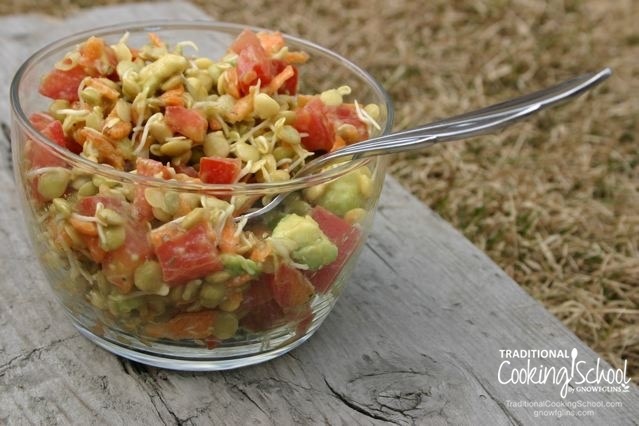 – I love mixing lentils that I sprout with a package of broccoli slaw. Then I add bacon bits, a little bit of shredded cheddar cheese, sunflower kernels, dried cranberries or raisins, garlic powder, onion powder, small amount of sugar or sugar substitute (opt) and real mayo to taste. Chill before serving. Yum! ? I just started sprouting and tried the tacos with sprouted lentils, sprouted refried beans, and a sprouted alfalfa salad mix – lots of sprouts! They were soooo good!! Will be doing this again. Thanks for sharing!! Thank you for the recipes, I am new to lentils and hoping to add them to my diet for health reasons. Hi, does it matter how long you sprout the lentils? I like sprouting them for several days, but my three-year-old will barely touch them. If I soak them, and sprout just a tiny tail, she has no problems eating them. Will we get as much benefit as long as they have at least started the sprouting process? Hi Meredith~ Yeah for toddlers who love lentils! 🙂 A quarter inch tail (or shorter if it must… you’ve got to work with your people!) is great. What’s her favorite way to eat them? Thanks Erin! She is a lentil vegetable soup girl, but she will eat lentil tacos as long as there is a little meat or beans so that it’s not straight lentil tacos! Great recipes! For the tacos, I don’t see how much of the 1-lb bag of sprouted lentils you would use. And how much of the taco seasoning? Thanks! Lentils are my favorite sprouts, too! I haven’t been so adventurous, though, and mainly used them as an addition in chili and similar dishes. Thanks for the new ideas.